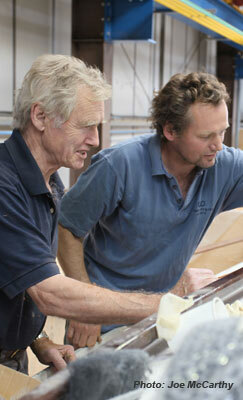 The Jeremy Rogers name is one associated with seamanship, craftsmanship and beautiful boats. Operating from the Jeremy Rogers boat yard at the Lymington Yacht Haven the Jeremy Rogers team have all the skills and equipment necessary to repair, maintain or refurbish your boat - or to build you a new Contessa 32. SInce the 1970's the business has also been at the leading edge of building with composite materials. Atlas Carbon Products is the trading name of this branch of Jeremy Rogers Limited. Whilst Jeremy himself has stepped down as Managing Director of the firm in favour of his son Kit, he is still a regular presence at the yard and on hand to pass on his life time of skill and experience. Kit Rogers, the new Managing Director of Jeremy Rogers Limited has been involved with the family business on and off since his late teens. He spent 11 years at sea as a yacht captain giving him many of the problem solving skills necessary to help guide and advise our customers and to see that jobs run smoothly and on schedule. Contact us on 01590 646780 or e-mail mail@jeremyrogers.co.uk for more information about our products and services.